I remember that block well. I had a girlfriend in eighth grade at OLP, Nora bauer who lived on the corner of 76th & Euclid on the west side of the street. Rich Considine lived on the east side just about opposite 7624. I don’t recall any two story homes on the east side of that block. We used to use that street as a route to Bidwell Stadium softball games. Great stuff. I also remember this, albeit not so well. I was only 5 at the time, and lived on 76th and Euclid about mid block, east side. 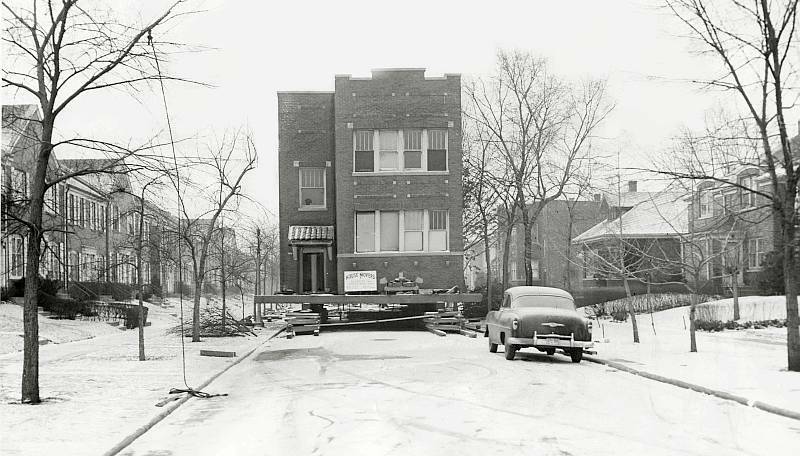 As I somehow remember, there were 2 of these buildings being moved, from the new site of South Shore Park (Rosenblum Park?) btw 75th and 76th, either Euclid or west side of Jeffrey Blvd. So, these guys were rolling this 2 flat building on telephone poles, hand carrying the poles from the leading edge to the back as it rolled along. I think it took a few days to complete the move. Quite an amazing sight, stayed with me for all these years. Glad someone took photos of this.